"Children can practise words for people at the circus, colour in circus scenes, listen to a song and read a story." "Have a look at the article, story, poem, cartoon, word games, trivia and links." 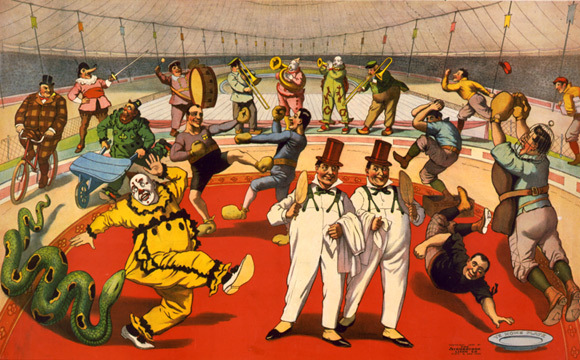 "Match 10 circus vocabulary words to their pictures. The words are: seal, clown, acrobat, lion, elephant, tiger, juggler, horse, tent, balloon." "Using a narrative story: Circus Escape"
"If there is someone who is going to reach out, shake your hand and befriend you at the circus, it's going to be the clown." says Big Apple Circus clown Joel Jeske. "Clowns fall down so we don't have to"."